A couple of weeks back, when I was at the BBC Good Food Show in Glasgow, I stumbled upon the stand of Mo’s Cookie Dough. Last year when there I purchased some of Mo’s dough to try out, which I did and I also used it to make some delicious Salted Caramel Cookie Bars. I loved the convenience of Mo’s Cookie Dough, simply take it from the fridge (or freezer) slice it up, pop in the oven and in no time at all you have delicious warm fresh cookies. Well, this year Morag (Pavich, the owner of the company) kindly gave me a couple of batches of her dough to use again in another recipe. There was the chocolate chip flavour which I tried last year, and the oatmeal raisin, which I hadn’t tried. Truth be told, I just baked the oatmeal raisin to see how delicious it was. And it was – with it’s gentle cinnamon spice and the juicy raisins. Being a fan of unbaked cookie dough I snacked on some raw, without fear of any salmonella as the eggs used in Mo’s cookie dough are all pasteurised. With the chocolate chip cookie dough I had, I knew exactly what I was going to do with that. If you love your cookies, but also frosting then this could be right up your street as I decided to make little cups out of the cookie dough and fill with some of my marshmallow frosting. I also added some Autumnal goodies I picked up recently in London – Pumpkin Spice Hershey Kisses and Harvest sprinkles. 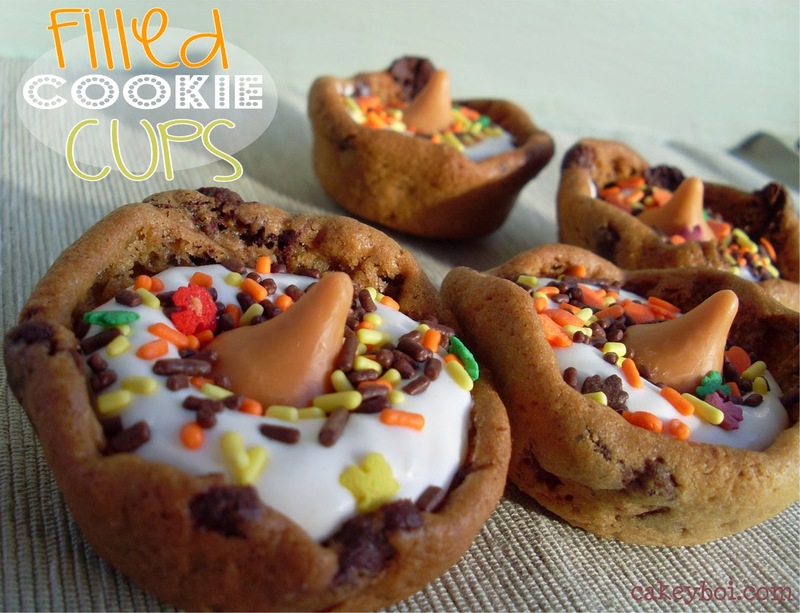 To make the cups, take the ‘log’ of cookie dough and roll it out to about ½cm thick. Take a cupcake tray and turn it over so the bottom's are all sticking up. Cover each cupcake bottom with foil. Preheat the oven to 180c. Next, using a circular cutter about 1cm wider than the cupcake well, cut out circles and place each one gently on top of the foil, pushing down gently to create the cup edges. Place the prepared tray back into the fridge for 30 minutes. Chilling again helps the cookies keep their shape better when baking. Place the chilled dough into the oven for 6 to 8 minutes, the cookies will look darker and have puffed slightly. Remove from the oven and allow to cool for at least 15 minutes before carefully removing each cookie cup and prising the foil out of each one. I used my marshmallow fluff frosting to fill the cookie cups, but you could use anything you like – whipped cream, buttercream, jam, caramel and any sweets you fancy. How about peanut butter or Rolos?! If you fancy trying these, with Mo’s Cookie Dough, it can be purchased in various outlets across Scotland and the North of England, including Whole Foods Glasgow. A percentage of the profits goes to local projects helping disadvantaged youngsters. Pop over to Mo’s website for further information. Oh yes…enjoy! Disclosure Statement: I received the cookie dough free to bake with. Any opinions expressed are my own. This is such an amazing idea! I love it! Love those Stuart, such a neat idea! Cartoon Time - Piece of Cake! Back from hols and a Big Treat Petite Apology!